This review looks at the Cygnett Unison i-X5 iPod speakers and docking station. We’ve been looking to buy a set of iPod speakers for some time now and finally opted for these. We bought the black speakers, but they are also available in red and white. Our first impressions of the speakers were very good. The built quality was very good and the high-gloss finish gave the speakers a lovely shiny appearance. The left speaker has a built-in amplifier, power switch, volume control, headphone jack, 6.5mm jack output, auxiliary left and right RCA line input, vent port and blue LED power indicator. The right speaker has an audio connection to join with the left speaker. The dock consists of one USB port, DC in, audio line-out connection and S-Video port on the rear, a remote control receiver on the front and a set of volume buttons on the top. Setup was very straightforward. The dock is plugged into a power socket using the power cable. The 3.5mm audio cable connects the iPod dock to the Aux In port on the left speaker. The Jack output on each speaker is then connected together using the 6.5mm audio cable. A variety of dock inserts are provided depending on your make and model of iPod. Slot the appropriate insert into the dock and then you’re ready to attach the iPod. You can optionally use the USB cable to connect the iPod dock to your PC and sync with iTunes. If you want to connect the speakers to a computer sound card or other audio device then a left and right RCA line input is provided on the back of the left speaker. Setup took us around 10 minutes. If you intend to view videos from your iPod then you will need to connect the provided S-Video cable from the dock to your TV. One of the mistakes I’ve made on this blog is not paying attention to the screen resolution used by visitors. Have you ever tried viewing your web site at different screen resolutions? You might be surprised at the results, especially if you use a fluid width theme like I do. Not paying attention to screen resolutions is an easy mistake. If your website displays poorly at other resolutions you could be losing out on valuable traffic. First impressions count so don’t make the same mistake as me. My PC at home uses a screen resolution of 1280×1024 and this blog displays fine at that resolution. Last week I visited my web site from a friend’s PC who uses 1024×768. I noticed that my blog didn’t display well at that resolution. Since I was using a fluid width theme I noticed the main body of each post was too narrow to read properly. I had a look in Google Analytics and noticed the majority of visitors to this site use 1024×768. Not good news. Assuming you use Google Analytics, you can discover what resolutions your visitors are using by accessing the Screen Resolutions option from the Visitors tab. I wonder how many of those 5000 visitors were turned off due to my web site not displaying properly. Quite a few I imagine. This represented a lost opportunity to gain new readers. So what have I done to fix this? I’ve started using a fixed width theme for starters. I’ve found this works better across a greater variety of screen resolutions, especially for web sites that use a lot of images like some of my articles do. There are more design improvements coming to this web site very soon so watch this space! I recommend you try viewing your own web site at different resolutions. It could be time well spent if you spot some mistakes. At some point Linux users may have to dabble with GRUB. I know this from personal experience when I trashed my Ubuntu install a few months ago. Many people may end up re-installing Ubuntu from scratch, but such drastic measures may not be necessary if you can master a few tips and tricks using GRUB. Hopefully you won’t trash your install like I did, but it is worth arming yourself with some knowledge of the inner workings of GRUB. Thankfully there is some excellent documentation out there. The GRUB manual is a good place to start. If you read up on some of this documentation you will learn that GRUB is more than just a boot loader. One site I recommend is the GRUB Page. This site will show you how to customize your GRUB menu, such as adding a GRUB splash image or changing the default operating system to boot up. There is a good section on how to back up restore your MBR too. I should have read this page a few months ago! Perhaps you want to hide the GRUB menu at bootup, or maybe your GRUB has been overwritten by a Windows installation. There are sections on that too. GRUB is a good diagnostic tool too. When my Ubuntu install was trashed I was able to use the GRUB command line to find out information about my hard disks and partitions, and more importantly which partition contained Ubuntu. This is useful when trying to recover a borked Ubuntu system. Another good defense mechanism you man want to consider is to create a GRUB CD-RW should things go wrong. I had problems where every time I booted up my PC the GRUB menu would fail to start. If only I had an alternative GRUB boot loader I may have had better success recovering my system. In my situation, I ended up reinstalling Ubuntu from the live CD. But if I had learned more about GRUB beforehand it may have been a different story. 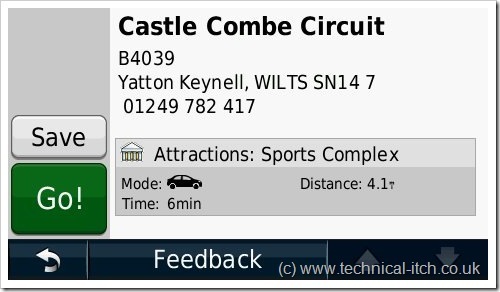 This article reviews the recently released Sony NV-U53 satellite navigation system. Sony is a name you might not immediately associate with sat nav systems but the NV-U53 performed very well. The NV-U53 is at the budget end of the Sony nav-u range but still packs a good punch. There are a few minor niggles but overall this is an impressive looking device. The NV-U53 is an impressive looking device. The widescreen looks fantastic and the whole device has a nice sturdy feel to it. The Sony is slim and compact, fitting easily in a coat pocket. The NV-U53 comes with a quick start guide covering over 20 pages which is sufficient to get you started. If you require any further information then the CD-ROM contains a PDF manual covering over 100 pages. The Sony is so easy to use though that you probably won’t refer to the manual much anyway. When you first switch on the device you are guided through the startup configuration wizard. This wizard will allow you to setup the language, distance unit (miles or km), brightness (day, night or automatic), time format (12 or 24hr clock), and home address. The only disappointment was the lack of a wall socket AC charger in the box. This means you can only charge the Sony by plugging the USB cable into a computer, or by plugging it into the cigarette lighter socket of your vehicle. You could always buy an AC charger separately but Sony should have really included one for the price. The NV-U53 comes with a built-in SiRF III GPS receiver. I’ve found these GPS receivers to be very good on other sat nav systems and the Sony performed just as well. You can establish a GPS signal even inside buildings provided you are situated close to a window. The very first time you use this device it does take longer to establish a satellite signal, but thereafter a satellite signal is established quicker. 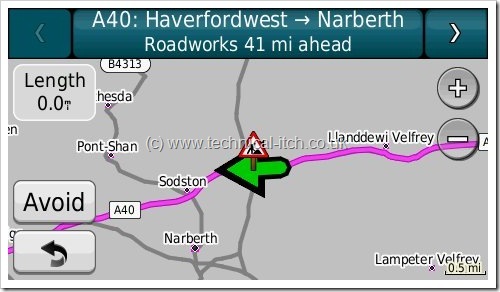 The NV-U53 comes with pre-installed NAVTEQ 2007 maps of UK and Ireland. I found the mapping software extremely accurate, in fact on a couple of tests it performed better than Garmin and TomTom. Some sat nav systems I find can miscalculate the number of exit points from a roundabout but the Sony worked perfectly each time. There is also partial map coverage for France and Belgium, but you’ll need to purchase separate maps if you want to seriously use the Sony around Europe. It’s good to see the WordPress folks patching these security vulnerabilities so soon. Many of you in the UK may be familiar with a recent broadband satisfaction survey conducted by the BBC Watchdog program. Some of these surveys need to be taken with a pinch of salt and there is always arguments about how accurate they are, but I was glad to see my ISP – Zen Internet – coming in 3rd place with a satisfaction rating of 93%. I’ve been with Zen for many months now and I’ve been extremely happy with the service I’ve received. I’ve never had to deal with their customer support team, since my broadband connection is so reliable, so I cannot comment on how good their customer support is. But in terms of broadband reliability I cannot fault them. This is completely opposite to the experience I had with Plusnet, my previous ISP. Much of the improvement in my broadband connection, since switching to Zen, is undoubtedly down to me improving the internal phone wiring in my house, and fixing a filtered ADSL face plate on the master socket. BT may have improved the technology behind MaxDSL since it was first launched as well? But I’m sure having my broadband connection with Zen has helped too. You pay a bit more with Zen but I think it is worth the extra. In addition, by focusing on broadband and hosting, rather than trying to provide a broadband, telephone or TV service bundle, Zen can focus on providing good service in one area, rather than being a ‘jack of all trades and master of none’. I would certainly recommend Zen if you’re looking for a decent internet service provider. For the last few weeks we’ve been playing with the LG GW620, the first Android phone from LG. Here is our quick review on how we got on. LG GW620The LG GW620 is a decent entry into the Android phone market. The Google integration is excellent and there are a large selection of free applications you can install. It needs a more responsive touch/slide interface, a larger screen, improved browser and an upgrade on the installed Android 1.5 firmware. If LG can improve these areas this would become a very attractive phone. Out of the box the phone looked good and of a decent build quality, nothing too flimsy and the phone looked like it would survive a few knocks and bumps quite easily. The phone was a bit chunkier than we were expecting but nothing excessive, the phone easily fits in the palm of your hand. Considering the slide out keyboard the overall dimensions of the phone are pretty good. The touch/slide interface at times is fiddly to use, and is not as responsive as the iPhone interface. You have to press the screen quite firmly before you can scroll the screen. This can make it difficult when navigating a list of options, you can end up selecting an item from a list when all you want to do is scroll down the list. Our other minor niggle was the proprietary USB port on the phone. For a phone that is trying adopt open standards we would have liked a standard USB port like those used on other devices like digital cameras for example. Other phone manufacturers are equally to blame in this area but it would be nice to see some standards between manufactures here. It certainly would save having different flavours of USB cable scattered around your home. We were disappointed to find that under the covers the LG GW620 is only running Android 1.5 (Cupcake). We would have preferred an Android 2.0 phone. The 2.0 version is better, more robust and provides a greater selection of applications. Since this is an Android phone the integration with Google services such as GMail and Google Maps is excellent. GMail contacts can be synchronised with the phone. This can provide a very powerful contacts management system on the phone, especially if you hold information like a person’s address and web site within your GMail contacts list. You can select a contact on the phone, click on their address and Google Maps will automatically start up and show you their location on a map. Click on a person’s web site URL and the browser will display their web page. There are a good number of applications available, both free and non-free, via Android Market, such as the BBC iPlayer. Android Market works pretty much the same way as the iTunes store does on an iPod, just search for an application and install it on your phone. Overall, I decided that the Garmin NuMaps was probably one of the most cost effective software i have ever purchased. Little Price, Simple Code and easy to use software to update my Garmin. What more could you ask for? 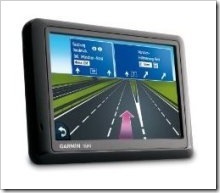 I have recently reviewed quite a lot of Garmin sat nav systems. Alot of people have been contacting me to find out the best and most efficient way to update their Garmin unit. I had to look into this and in doing so, i managed to stumble across the Garmin NuMaps Lifetime Map Update for UK and Europe. The Garmin NuMaps cover the whole of the UK, ROI and Western Europe which includes detailed maps of major metropolitan areas in Europe, including motorways, national and regional thoroughfares and local roads. Other possible ways of updating the Garmin units are with subscriptions with Garmin themselves but this would cost up to £80 a year. I found this to be quite expensive considering most of the Nuvi’s are around that price anyway. However, when I came across these Garmin NuMaps, I found that they did alot more for you than want a single map update would do, and worked out to be nearly half the price. These Range from £48.34 to £90! The cheapest i found to be was Lemon Digital. So £48.34 for mapping for the lifetime of your system. Not Bad? Upon ordering the product I had to check whether or not it was compatible with the Nuvi 770. So I contacted Garmin and they confirmed that it is compatible with the Whole Garmin Nuvi, Zumo, Streetpilot and Quest range! In My opinion its quite a big packaging considering its only protecting a credit card sized gift card with a small unique code on the back. However, I paid for the code not that packaging so that’s what I am going to review. On the reverse of the package there was a brief explanation from Garmin just confirming what models were compatible with the code. Furthermore, there was also a link for me to go to if I had any problems or needed more information. Upon opening the package I found the card to be a bit like a scratch card. The code being on the back. The back of the card tells you exactly how to set up your Garmin Map Update and what links to go to. Once I scratched off the back and revealed my code I had to activate the card with the URL given. Here I had to create a username, password and type in the product key from the back of the card. Once this was set up I was able to update my system easily enough. 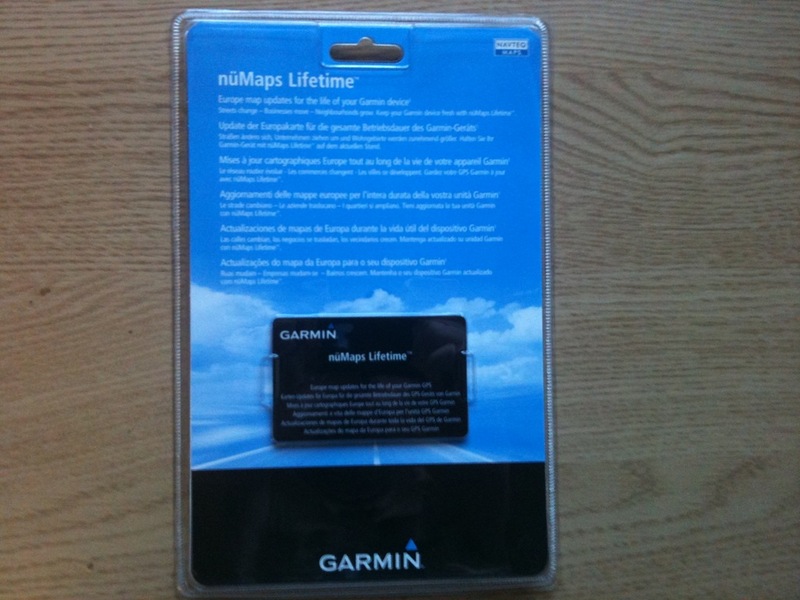 To use NuMaps Lifetime, all you need is your Garmin device, your computer and a USB cable. “There are no monthly fees or continuing maintenance costs”. To update my maps all I had to do was connect my device to the computer and log into my “myGarmin” account, where the latest map data was ready to install. It gave me a list of countries that I wanted to be updated and I just chose which ones I wanted and away it went. It took me 3 Hours to update the system, but I was in no rush and paying just £48 I wasn’t fussed. This review looks at the Garmin Nuvi 1490T. This system is one of several new releases by Garmin this year. The Nuvi 1490T is aimed at the higher end of the market offering features like lane assist, junction view, route planning, speed camera warnings, traffic alerts, bluetooth, ecoRoute, public transport and pedestrian modes. It also sports a large 5 inch screen. The Nuvi 1490T looks a nice system out of the box and is well constructed. Despite the large 5 inch screen it is surprisingly easy to carry around with you and is only 15mm thick. The suction cup, cradle, power cable and traffic antenna are the same design as other recent releases by Garmin. The traffic antenna and power cable are two separate cables, with the traffic antenna plugging into a small socket on the power cable. This means you have the option to take the Nuvi 1490T out on the road without the traffic antenna cluttering up your windscreen if you wish. This is an improvement over earlier models like theNuvi 770 where the traffic antenna and power cable were one unit. Setup in the car was a hassle free process and we found the suction cup and cradle easy to use. Initial satellite acquisition was also quick. One of the features offered by the Nuvi 1490T is junction view and lane assist. When approaching a complex junction the screen will switch to junction view for a few seconds to help you get in the right lane. Out on the road we found the lane assist worked well. Signposts displayed on screen were identical to the real ones on the road and plenty of warning was given when required to change lanes. The Nuvi 1490T includes a subscription-free traffic alert service. This service will warn you of any traffic problems on your route giving you the option to take an alternative route. As with other systems we’ve reviewed over the years we found the traffic alerts to be a bit hit and miss. Sometimes it would be spot on in warning of upcoming delays. On other occasions it would warn of queuing traffic ahead only for there to be no delays at all. It is also worth noting that on a couple of occasions the traffic receiver was unable to pick up a signal, and this lasted for several miles before reception was regained. So our advice would be to not expect perfection from the traffic alert service. As far as speed camera alerts are concerned the Nuvi 1490T was very good. It excels best with fixed cameras, in our tests it passed with flying colours in this department. It did a pretty good job spotting mobile and temporary speed cameras too, but there were times where it could have done better. This is to be expected though. 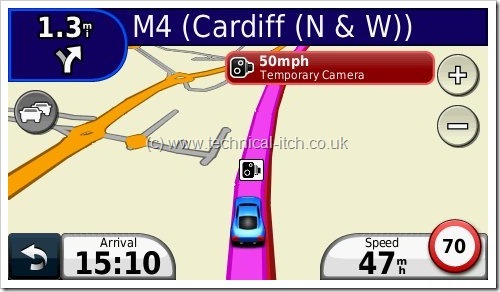 Temporary speed cameras, such as those in motorway roadworks, are always on the move and it is important to update the speed camera database on the Garmin from time to time. Speed camera updates can be done via the Garmin web site. There are also a number of 3rd party web sites offering the same updates, often at a cheaper price, such as the Garmin speed camera plugin from SCDB.info. You can also see in the screenshot above that the Nuvi 1490T displays the current speed limit for a given road in the bottom right of the screen. This can be useful, especially when driving on unfamiliar roads where you’re not sure of the speed limit. In our tests the Nuvi 1490T did an excellent job displaying the correct speed limit. As with all Garmin systems we’ve reviewed the Nuvi 1490T includes an extensive points of interest (POI) database. The Nuvi 1490T also includes a feedback feature where you can report any anomalies you find, such as a point of interest in the wrong location. This is a fairly new addition to the Garmin range and was introduced to compete with similar offerings from TomTom, like the TomTom Go 740 Live we reviewed earlier this year. We tested the Nuvi 1490T over the course of a week. During this time we ran into a number of issues. None of these are major but when put together it does raise concerns over the build quality. Around day 3 of testing the speaker would not work when the unit was switched on. We would be driving several miles and then realise there was no audio for the voice directions. We checked the volume settings and the volume was not muted. We found that by either increasing or decreasing the volume the speaker would suddenly kick back into life. This problem occurred every time we used the system thereafter, even after doing a factory reset. On one occasion the unit got stuck in USB mass storage mode whilst in the car. This basically means the Nuvi 1490T thought it was plugged into a computer rather than a vehicle meaning we couldn’t navigate anywhere. The Nuvi 1490T just displayed a computer icon on the screen and we couldn’t do anything. We found that once we started driving the unit would reboot itself and then return to normal navigation mode. This problem only occurred once but was not something we expected. The first time we plugged the Nuvi 1490T into a computer using the USB cable it would not connect properly. The Nuvi 1490T repeatedly rebooted itself and in the end we just disconnected it from the computer, then tried reconnecting and the second time it connected successfully. We ran into a couple of issues with the mapping. On one occasion it directed us through a town centre rather than using a bypass and another time the directions had the wrong road number. We’ve run into these type of issues when reviewing other systems, so we were not particularly concerned. Over the course of a week of thorough road testing these were the only two mapping issues we discovered. 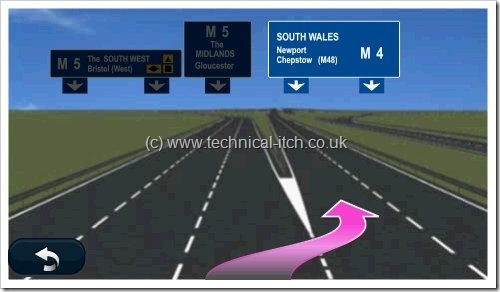 In our experience no sat nav system is perfect in this area, so don’t let this issue put you off. One other minor niggle. There were a couple of times where we felt the Nuvi announced upcoming turns too early, which in a busy city centre could result in you taking an earlier turn by mistake. For the majority of our tests though we didn’t find this a problem, but worth noting nonetheless. Part of us would like to think that we simply reviewed a dud model, but we ran into a few issues when we reviewed the Garmin Nuvi 775T earlier this year too, so we feel there are a few question marks over build quality recently, especially when you consider the price tag. The Garmin Nuvi 1490T is a nice looking system that performs well as a navigation device. There are a few question marks over build quality though and we’re not convinced this is a good buy when you consider the price tag. Our advice would be to shop around for something cheaper. If you don’t need the route planning or bluetooth then the Nuvi 1340T is quite a bit cheaper and worth a look.